The brew day for our fourth annual Funky Dark Saison is right around the corner and I'll be blending and bottling the third batch this weekend, so there was no time like the present to taste the second batch aged on Cabernet Sauvignon grapes. At two years old it is a wonderful marriage of sour beer and wine: hearty, complex, and still balanced. Appearance – A thin off-white head sits on top of a nearly opaque dark brown body. During the pour I can see deep purple tones, but the beer is too dark for them to be visible in such a wide glass. The edges look clear (not surprising after two years). Despite the poor head retention the ring that persists is trailed by lacing. Smell – Huge aroma that I can smell as soon as I start pouring. Toasted and chocolate malt, jammy fruit, spice, and clean alcohol. It is hard to tell if the spice is from the yeast, grapes, oak, or black cardamom (probably something from all four). Taste – Starts like a bold red wine, the sourness hits the middle of the tongue fading as the malt picks up in the finish. I love a beer that progresses through each sip, changing as it travels over the tongue. The lactic acid is smooth and not overpowering, but there is no question that this is a sour beer. The peppery spice of the yeast comes through more than in the aroma. ~11% ABV adds warmth, but the sourness hides the booze surprisingly well. Mouthfeel – Doesn't come off as thin or hot, but the featherweight body and moderate-high carbonation let you know it is Belgian. The tannins extracted during the long time spent sitting on the grape skins helps to add firmness. Drinkability & Notes – I think this batch is terrific, I'd put it up against Russian River Consecration any day. The grapes temper the black cardamom, and their sugars helped spur additional souring. I'm trying to hang onto as many bottles as I can, this one should be even better in a year or two. This sounds terrific. I'm gonna have to get something like this going soonish. I'm still a noob and my brewing setup is limited to extract+grains on a stovetop, but this sounds delicious enough to go all-out for! Out of curiosity - where'd you find the (fresh?) grapes? The grapes were frozen from Midwest Brewing, and a couple years old. I bought a five gallon bucket on sale, and took about a year to use some and sell the rest at cost to friends. I'd love to get fresh wine grapes, but around here that seems impossible in reasonable quantities. It sounds like this batch worked out perfectly... I'd love to give it a taste. I have a few questions about the grapes if you have time. How long did you leave the grapes in secondary? Did you include skins, seeds and all or did you juice them? I've got some muscadine grapes I traded for and am interested in using those in a similar fashion. The grapes were frozen, which causes their cell walls to rupture and leak a lot of juice, but the skins and seeds were added as well (I tried to pick out any stems). They spent about five months in the beer after the beer was about a year old. Muscadines sound like a lot of fun, what kind of beer are you thinking of adding them to? I also have about 8 - 10 lbs of frozen Choctaw plums from OK that I want to do something similar with as well as couple of gallons of frozen apricots that I have seeded. I was thinking of doing one with WLP 530 and then finishing up with Bret Trois, one with all Brett Trois and one with 530 and Bret Brux to finish. I will probably use a different kind of honey as secondary addition instead of the kettle sugar additions. Oh yeah, thanks for the response, that helps me out a great deal. 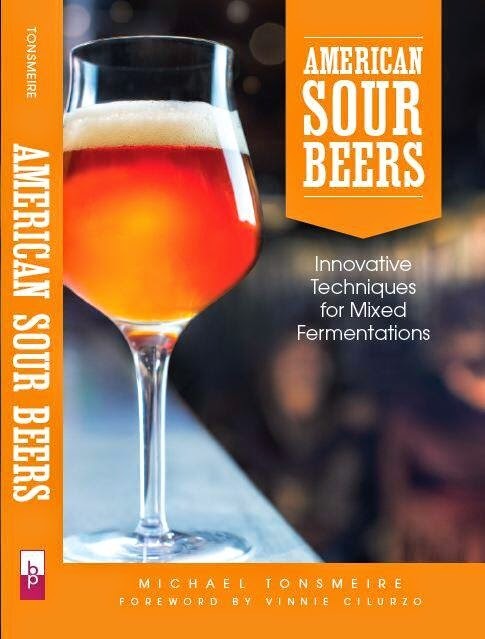 I really enjoy reading about your beer making tales. I originally found your site when searching about mead and found your cranberry-orange mead tale. Grapes can certainly work in a pale beer, but you might want to back down on the length of time it is left sitting on the skins. Five gallons of our pale/sour solera spent 3.5 months on 8 lbs of Cabernet sauvignon and was really good. I need to bottle my sour dubble on plums. Glad you've enjoyed the blog! I have the most recent bottle of that mead sitting in my basement, looking for a good excuse to open it. My friend Mat (who helped me brew/bury it) recently moved to Kenya, so he may not share one for a couple years. Good luck, sounds like so fun beers! I did get riesling grapes from a winery last fall and i vacuumed pack them and frozed them. I am planning on brewing a light french/berlgian saison and add the grapes in secondary. In terms of hops i was thinking of sorachi ace or nelson sauvin? Would love to have your feedback and pick your brain about a solid base for riesling grapes. Sorachi Ace is very hit or miss to me, it can come across Lemon Pledge, but in a blend it can work well. Nelson seems assertive enough to balance it. Riesling tends to be pretty bright, so I'd think a pale beer would be a good start. With wine grapes, I go light on bitterness, some acidity helps, funk is optional. Good luck!